Whether you are a professional or a novice, this sharp and durable throwing axe will help you hone your throw to perfection. The 7" black stainless steel blade is extremely sharp and runs seamlessly into the 4.5" laced handle. Comfortable to grip, the axe is full tang which adds extra durability and power to each throw. It is well balanced and will penetrate and imbed into almost any target. Coming in at a hefty 9.0 oz, a powerful impact is ensured with every throw. 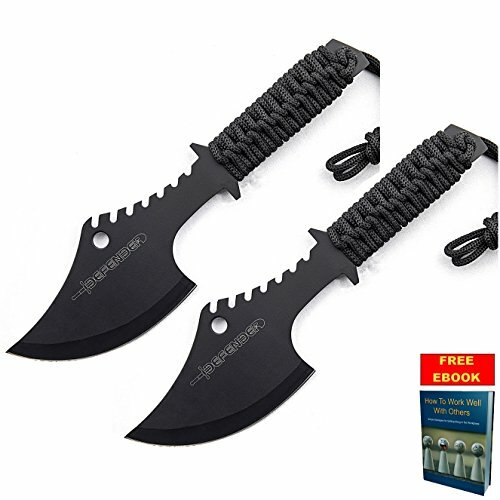 Comes with a tactical sheath so you'll be able to take it with you wherever you go. If you're looking for a reliable throwing axe that will fly straight and demolish your target, then this is the axe for you. Includes a FREE eBOOK by Only US for a GIFT. You Will Receive TWO Axes. Heavy Duty Throwing Axe. 11.5" Overall Length - Well Balanced. 7" Black Stainless Steel Blade - Very Sharp. 4.5" Laced Handle - Very Comfortable Grip. Full Tang Steel. 9.0 oz Weight. Includes Tactical Sheath. Item is Brand New and Factory Sealed. 30 Day Money Back Guarantee. Includes a FREE eBOOK by Only US for a GIFT. If you have any questions about this product by Only US, contact us by completing and submitting the form below. If you are looking for a specif part number, please include it with your message. New Survival ProTactical'US - Limited Edition - Elite Knife with Sharp Blade Silver Fixed-Blade Black Handle w/ Kit in Handle, Sheath 15"